I talk a lot about scent and how important it is, but have never really been a fan of perfume. Almost every perfume I have ever smelled has instinctively made me pull away. It seems they are either too strong, too sweet, too cloying, too acidic, too overpowering, too musky or – worst of all – too gosh darn 'chemical-smelling'! I am 'one of those people' who will automatically seek an alternative path if I find myself walking behind a person who is so doused in perfume that it can be smelled from a distance. I have – more than once – experienced swimming half a lane behind a person (and we're talking men as well as women) where their perfume (or aftershave) permeated the water to such a degree that it overpowered the chlorine in the pool. In my world, swimming in a mix of perfume and chlorinated pool water is seriously offensive! It's a little strange to have this attitude towards perfume seeing as how passionate I am about creating cosmetics. Even odder, I really enjoy working with essential oils – (some of) the stuff of which perfumes are made! How do I explain that? Honestly, I can't – except to hazard a guess that commercial perfumes are predominately composed of synthetic ingredients while I am working with natural, plant-based ingredients. 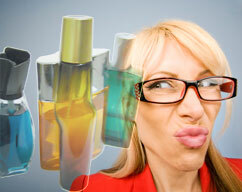 Mind you, there are essential oils that don't float my boat either, so maybe I'm just a total scent snob. Come to think of it, that is a distinct possibility. Warning! Body Butter Can Make You Fat! The Sage Saga - Can Sage Tame Hot Flashes? You Can't Give That Away!